I had been volunteering on Sundays at Safe Haven Farm Sanctuary for a few months and the exciting and wonderful opportunity arose for me to take a full time position! Naturally there were plenty of job change decisions to consider. However, the same day the opportunity came to me, I was raking in the back yard area behind the cottage. 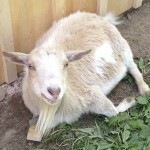 It was a gorgeous sunny day, and who came by to hang out with me but Daisy, the beautiful dwarf Nigerian goat. She seemed content to graze the grassy area and keep me company while I worked. My love for her was growing as she followed me around all day. It was Daisy that actually cinched the deal. If I would get to experience this peace and love regularly, this was the job for me! That brings me to my first life lesson from Daisy the Mini Goat. Lesson 1. Companionship is a great gift. What Daisy did that day was really simple. She was there for me. Did she know that I was in the midst of one of the most life-impacting decisions I would ever make? I’m sure she didn’t, but her simple act of being there meant so much to me. She gave me something greater than material possessions – she assisted in a complete and comfortable knowing that this was the right decision for me. Simply being with me was all I needed to finalize the choice. Moreover, in the first few days of working at the Sanctuary (as winter’s grip began to take hold), I experienced some beautiful sunny days, rainy downpours and also lots of snow – a real jump right into what full time sanctuary work is like. In tiny random moments asking myself if I had made the right decision, who would appear? Daisy of course! As if to say “You did” and “I’m so glad you’re here!” – How lucky I was to have this friend who gave me such reassurances. Daisy gave me a new appreciation of the value of companionship. Daisy was adorable to me. She could do no wrong in my eyes. If she was in the chicken coop once again, eating their grain, it was endearing to me. Others sometimes found her clowning around to be “annoying” and for it to be cumbersome when she was “in the way”. To me though, she was simply enjoying her life and in doing so she brought wonderful joy to my life. Daisy reinforced the notion that that people have different views on individual personalities. We must surround ourselves with those that have an understanding of what we love and what we enjoy. Believe in yourself for what you are, and when people judge you (which they will) just know that to love yourself is all that is required. Seek to fill your world with those that lift you up and ignore those that put you down! Above all, be yourself and embrace it. That’s what Daisy did! Daisy had one short front leg. She also suffered from arthritis. This gave Daisy a little sway when she walked. But these handicaps didn’t stop Daisy from living the happiest, fullest life she could have! Whenever she fell, Daisy always got back up. Sometimes she would need a little assistance from her human friends, but once she was up, she would carry on with her day and never look back. Throughout life we will inevitably be kicked down or even trip on our own shoelaces but just get right back up (by all the good means you do have) and move forward. Be open to the help that the universe will provide you. Daisy never viewed her short leg as a limitation; in fact, I believe she used that little short leg to her advantage to squeeze into tight spaces. Don’t let your shortcomings be your focus. Focus on all that is good in your world and be grateful for the little things that can secretly work to your advantage! Take time to appreciate yourself and your good qualities. You have many, as did Daisy. Lesson 4. Go on adventures and eat awesome food! Daisy, being a miniature goat, could squeeze that cute little body into some pretty small spaces. I found her one afternoon inside Big Red the Rooster’s area, which could only be accessed by a door about one foot high by one foot wide. Daisy didn’t look that small to me! I walked into the area and there she was, very quietly and secretly chomping away on the chicken’s grain! She looked up at me with that cute little tilted head as if to imply “Isn’t life great AND I love to eat”! That’s not the only chicken coop area I found her in. More often than not, if food was involved, Daisy was there. On more than one occasion I found Daisy, stealthily having snuck through yet another gate, hanging out in the compost heap, foraging for any tasty leftover breakfast treats from her friends at the farm. What a wonderful way to live. Go anywhere you can to find nourishment, whether that nourishment is food, love, serenity, laughter or even a good book. Seek what gives you pleasure while not causing cruelty and harm to others fellow beings. Do as Daisy did and be sure to explore the world and relish in all its beauty and eat healthy and heartily! An extra tip from Daisy… as an herbivore, you can eat wonderful, healthy, tasty food and help diminish cruelty in the world! Why not try it? With the loss of Daisy – I was genuinely hurt, but every day I am grateful that I got to spend the time I did with her. The memory of her sweet smile and adorable little head tilt has been etched on my heart and I will carry it with me always. Have a Mini Goat kind of day!